From the sidewalk outside the gallery, the viewer finds a peephole through the snow-frosted window, allowing them to peer into the otherwise hidden dream-like interior of the ice cave. 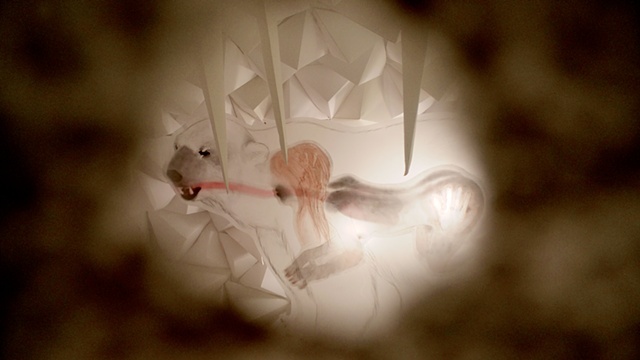 The painting, created by Kendler, references cave painting and is made from multiple layers of transparent vellum. These hidden worlds suggest a visceral bodily understanding of nature, born of surrender into this territory of otherness. This form of "peripheral" observance nurtures an alternate method for the exploration of our relationship to this sublime otherness, where melting no longer connotes an act of loss, but becomes a generative act, blending disparate elements into a new whole.